Jersey Mike's has a deal for National Sandwich Day. In Alabama, barbecue is often smoked pork, but Leo and Susie’s Famous Green Top Bar-B-Q began smoking chicken at the request of a few customers, and the Smoked Chicken Sandwich was born. The eatery hickory smokes boneless, skinless chicken on indirect pits and serves it with pickles and homemade sauce — white, barbecue or both — on a burger bun. The White Spot Cafe is one of the longest-running restaurants in Anchorage, Alaska, and it has been offering its now famous Halibut Sandwich for almost 30 years. A generous filet of halibut from nearby waters is lightly battered and deep fried to crispy perfection on the outside while the middle is moist and flaky. It’s served with cheese, tartar sauce, shredded lettuce, tomato and onion on a bun with a side of fries or coleslaw. From Chris Bianco, the owner of Arizona’s nationally renowned Pizzeria Bianco in Phoenix, Pane Bianco offers sandwiches on freshly baked focaccia bread that are then baked to order in a wood-fired oven. The Housemade Mozzarella features creamy mozzarella that’s made fresh daily, heirloom tomatoes, fresh basil and extra virgin olive oil. This sandwich is truly a testament to the power of fresh, homemade ingredients. A lunchbox favorite, the bologna sandwich is a classic and Johnny B’s Grill in El Dorado, Ark., makes one of the best in the country. With a second location that opened last year in Texarkana, the family-owned restaurants bring comfort food to both communities. The fried bologna sandwich, ringing in at just $2.29, comes with two slices of fried bologna, shredded lettuce, tomato and mayo, with pickle slices on the side. Family-owned Snarf’s Sandwiches opened its first location in Boulder, Colo. in 1996 and has grown to more than 20 restaurants in Boulder, Denver and around the country. A favorite since day one, the Meatball Parmesan is a thing of beauty: pork and beef meatballs are smothered with marinara sauce and provolone and Swiss cheeses, sprinkled with Parmesan and Italian seasoning, and served on oven-toasted white or wheat bread. To add a little kick, ask for the giardiniera peppers, which are so popular they’re sold by the jarful. In Clinton, Conn., Lobster Landing makes the premier example of a Connecticut-style lobster roll: a quarter pound of fresh lobster meat is loaded onto a toasted grinder roll from Koffee Kup Bakery in Vermont, then hit with a squeeze of fresh lemon and drizzled in melted salted butter from Cabot Creamery. The charming seaside building is more than 100 years old and is now the epitome of a New England lobster shack. Back in 1976, Capriotti’s founders sought to create a sandwich for “real turkey lovers,” so they started roasting whole fresh turkeys overnight (a tradition Capriotti’s still upholds) and combined it with cranberries, homemade stuffing and a hint of mayo on a freshly baked roll, effectively making everyday Thanksgiving. The original Capriotti’s is in Wilmington, Del., and today there are more than 100 locations across the USA. Choosing the best Cuban sandwich in Florida is a little like trying to find the best gelato in Italy — all of the options are pretty good. There’s a lot to choose from, but we’re big fans of the Cuban from Columbia Restaurant in Tampa — and we’re not the only ones. Founded in 1905 by Cuban immigrant Casimiro Hernandez, Sr., the landmark eatery still uses his original 1915 recipe for the sandwich. Ingredients are important, and Columbia carefully layers ham, roast pork that is marinated in-house with garlic and sour orange, Genoa salami imported from Italy, Swiss cheese and dill pickles between local La Segunda Central Bakery Cuban bread before pressing to perfection. In Atlanta, the Shrimp Po’boy at Star Provisions is so popular that the team opened a fast-casual restaurant called W.H. Stiles Fish Camp based on its success. The sandwich consists of a buttered and griddled soft pain de mie roll that’s slathered in spicy homemade mayonnaise and filled with Kosher dill pickle chips, sliced tomato, and six large Gulf or Georgia white shrimp that are dipped in buttermilk and dredged in seasoned flour before being fried to crispy perfection. In Hawaii, the word “kalua” refers to a cooking method using an imu, or underground oven. Not surprisingly, pork is a favorite protein to be roasted this way and of course makes a perfect sandwich filling. Highway Inn, which has a few locations in and around Honolulu, serves this pork in the form of sliders with a taro (starchy purple root vegetable) roll, bell peppers, onions and a spicy Hawaiian chili aioli. You may be surprised to know that Idaho makes a solid Philly Cheesesteak. And Best Sandwich Shack puts a unique spin on it with the Yoshi. Born from a friendly competition with a neighboring sandwich shop, the Yoshi adds pepperoni and sausage to the traditional cheesesteak recipe of thinly sliced sirloin steak that’s topped with provolone cheese — and in this creative version — ranch dressing. A torta is a Mexican sandwich served on a crusty roll and filled with a variety of piquant combinations. At Xoco in Chicago, celebrated chef/owner Rick Bayless fills the Pepito​ torta with juicy braised Creekstone short ribs, a heap of caramelized onions, gooey jack cheese, black beans and pickled jalapeños for just the right amount of kick​. After a decade in Indianapolis, Goose the Market is always busy. The Batali Sandwich, named after you know who, is the only constant in a rotating daily menu of five or six sandwiches. Packed with a rainbow of Italian meats including coppa, soppressata and capocolla as well as provolone cheese, romaine lettuce, house marinated red onions and spicy giardiniera pickles that are smothered in mayonnaise and tomato preserves, this spicy sandwich is definitely a crowd pleaser. Iowa is famous for its loose meat sandwiches, which were invented here in 1926 by butcher Fred Angell. Often confused with a Sloppy Joe (which is way more saucy), Angell’s creation consists of ground beef seasoned with a select (and secret!) blend of spices served on a hamburger bun. It can be topped with melted cheese, ketchup, mustard, onions and/or pickles. Angell started the Maid-Rite franchise, with locations across Iowa and the Midwest, which all serve the loose meat sandwich known as the Original Maid-Rite. Joe’s Kansas City BBQ is renowned for its smoky barbecue and the Z-Man sandwich. Named after a local radio personality, the sandwich uses the joint’s excellent sliced smoked brisket and tops it with smoked provolone cheese, a couple of onion rings and a bit of barbecue sauce on a Kaiser roll. One can’t think of sandwiches in Kentucky without the Hot Brown coming to mind. At The Brown Hotel in Louisville in 1926, Fred K. Schmidt invented the open-faced sandwich of turkey, tomatoes and bacon to serve late-night revelers. It’s covered in Mornay sauce, sprinkled with Parmesan cheese and broiled until the top is gooey and the bread is crispy. Variations are offered all over the state and beyond, but you can still get the original at The Brown Hotel. Po’ boys in New Orleans and Louisiana are a dime a dozen, but that doesn’t mean they’re all good. It’s hard to choose a favorite, but you can’t miss the fried oyster po’ boy from Domilise’s, a restaurant and bar founded in 1918 inside a small yellow house in the residential Uptown neighborhood — you’ll know it by the long line out the front door. The family-run restaurant’s fried oyster po’ boy is a masterpiece with large hunks of breaded, fried oysters that are dressed with lettuce, tomatoes, pickles, mayo and hot sauce. Tuna melts, while a diner standard, can be pretty lackluster. Not so at Maine’s Palace Diner. The Biddeford eatery’s Tuna Melt comes on griddled Challah bread with mayo, an iceberg lettuce steak, house-made bread-and-butter pickles and tuna salad composed of red onion, celery, cucumber, fresh herbs, mayo and mustard. It’s topped with cheddar cheese that’s melted to perfection. Yes, Maryland is famous for its crab cakes, and chef Chad Gauss takes it the next level at The Food Market in Baltimore’s Hampden neighborhood. His signature Club Sandwich is bursting with shrimp salad, a crab cake and the customary bacon, lettuce and tomato. In Waltham, Mass., Domenic’s Italian Bakery & Deli dates back 30 years. Run by a third-generation baker and butcher/salumiere, the eatery bakes ciabatta bread every morning and tops it with high-quality ingredients including imported Italian meats and cheeses, and fresh vegetables. The Parma, with imported black label Parma Prosciutto, basil-marinated tomatoes and fresh mozzarella, is pretty unbeatable. Ann Arbor’s Zingerman’s gets a lot of the sandwich love in Michigan, but we’re showcasing Detroit’s Mudgie’s Deli for its Barrett sandwich. Made with Sy Ginsberg corned beef (a local favorite), creamy coleslaw, Swiss cheese and Thousand Island dressing piled onto an onion roll, this warm sandwich is a pretty great version of a Reuben. A food truck and restaurant in Minneapolis, Hola Arepa serves Venezuelan sandwiches, also known as arepas. These are handmade daily from a cornmeal dough and formed into patties that are cooked on a griddle, split open and stuffed with a variety of Latin fillings. The Shredded Beef and Plantain Arepa is filled with fried sweet plantains, shredded beef, black beans, Hola sauce (a sweet and tangy herb sauce), Cotija cheese and pickled red onions. An institution in Jackson, Miss., Big Apple Inn was started by Juan “Big John” Mora. He created the Pig Ear Sandwich early on, when he received a bunch of pig ears from a local butcher who was throwing them away. The restaurant is now run by his great-grandson, Geno Lee, who still makes pig ear sandwiches. Not for the faint of heart, the pressure-cooked pig ears are cut into thirds and covered in mustard sauce, slaw and hot sauce, then sandwiched between a griddled bun. Can’t stomach it? Ask for a “smoke” (that’s sausage) sandwich instead. For a century, Gioia’s Deli has been a fixture in St. Louis, garnering a James Beard Classics Award in 2017. The signature Hot Salami sandwich — hot in temperature, not spice — has been a staple and bestseller for years. It’s a secret blend of pork, head meat and seasoning that’s formed into a sausage and sliced hot to order. It’s served on local Italian bread, topped with the customer’s choice of garnish and St. Louis’ beloved Provel cheese. In Butte, Mont., Pork Chop John’s is home to John’s Original Pork Chop Sandwich. Three-and-a-half ounces of lean pork sirloin is lightly breaded, battered and deep-fried to make a juicy, tender but crispy pork chop. John's Original is placed on a bun and garnished with mustard, pickle and onion, while John’s Deluxe is served with mustard, pickle, onion, mayonnaise, lettuce and tomato. Did you know that Nebraska stakes a claim to the invention of the Reuben? Charles Schimmel, the owner of the Blackstone Hotel in Omaha, is said to have created it with his poker buddies (one of whom was named Reuben) one night. The celebrated Blackstone Reuben from Crescent Moon, across the street from the old hotel, pays homage to the original. Made with locally sourced corned beef from Omaha Steaks, locally baked marble rye from Rotella’s Bakery, Swiss cheese, sauerkraut, Thousand Island dressing and a combination of secret spices, the Reuben has been on the menu for more than 21 years. Nevada’s Deli Towne USA is a gas station deli in Reno that calls itself the “Home of the Monster Sandwich,” as in huge sandwiches. The Italian is loaded with provolone cheese, lean ham, salami and Cappicola, that’s smothered in mayonnaise, mustard, olives, pepperoncini, lettuce, tomato, purple onion, oil, vinegar, salt, pepper and oregano, all on a garlic Swiss rosemary roll. It’s got a lot of flavor and a ton of textures thanks to the plethora of ingredients. While a sandwich called The Dumpster may not sound appetizing, Sandwich Master in Rindge, N.H., makes it so. The ultimate hangover food, The Dumpster has chicken fingers, deep-fried mozzarella sticks and fried battered onion rings topped with mozzarella cheese and marinara sauce and stuffed into a grilled sub roll. Over the top? Sure. Delicious? Definitely. The New Jersey Sloppy Joe is entirely different than the saucy, ground-meat Sloppy Joe of 1980s dinners. In North Jersey, Sloppy Joe means a double decker cold deli sandwich and the Millburn Deli makes some good ones. Try the Corned Beef and Roast Beef Sloppy Joe, made with house-roasted beef, homemade coleslaw, Russian dressing and Swiss cheese on three slices of rye bread. In New Mexico, Bocadillos calls itself a slow-roasted sandwich shop, specializing in slow-roasted meats. The Albuquerque eatery makes the 505 Filthy with slow-roasted chicken breast, thick-cut bacon, New Mexico green chile, Asadero cheese, lettuce, tomato and house-made chipotle mayo. New York takes its sandwiches seriously, so choosing just one is hard. While the city is known for its meaty deli creations, some of its vegetarian inventions are so unique and tasty that even meat lovers order them regularly. Case in point is Sub No. 7’s Broccoli Classic. The broccoli is roasted until charred on the edges and paired with pickled lychees, called muchim, a Korean type of pickling that uses chiles, ginger, garlic and sesame. To assemble, Sir Kensington's Fabanaise is spread on Italian bread from Brooklyn’s Caputo’s and the broccoli and lychees are topped with feta cheese and fried shallots. The combination of bitter, sweet, sour, salty and crunch is unbeatable. Is it wrong to choose a fried chicken sandwich from a barbecue joint? Not when it’s the fried chicken sandwich at Buxton Hall in Asheville, N.C. The chicken (all natural, free-range, sustainably raised chicken from Joyce Farms in Winston-Salem, N.C.) in the Original Buttermilk Fried Chicken Sandwich is smoked along with the restaurant’s whole hog so you get that smoky barbecue flavor. Then it’s dipped in buttermilk and deep-fried, topped with American cheese, pimento cheese, white barbecue sauce, and bread-and-butter pickles, and served on a toasted bun. With locations in North Dakota’s biggest college towns, Grand Forks and Fargo, Red Pepper has been a state landmark since the 1960s, serving up fresh-made grinder sandwiches that live up to their reputation of being “down right addictive.” The Everything Grinder has your choice of ham, salami or turkey with Swiss cheese, shredded Colby cheese, taco meat (lean ground beef), white sauce and hot sauce. Cleveland’s strong Eastern European roots led to its most known sandwich: the Polish Boy. It’s a grilled or deep-fried kielbasa in a bun, covered with French fries and coleslaw, and drizzled in barbecue or hot sauce. Try one at Seti’s Polish Boys, a popular food truck. Oklahomans love their chicken fried steak (tenderized steak that’s battered and deep fried) and it’s no surprise that it comes in sandwich form. In Tulsa, Tally’s Good Food Café is known for its Chicken Fried Steak Sandwich, a huge slab of chicken fried steak on a fresh bun with lettuce, tomato and mayo, and a side of white gravy. In Portland, Ore., Lardo is a food cart turned sandwich shop that proudly celebrates its excesses. The Cold Fried Chicken is a menu staple that consists of fried chicken, bacon, blue cheese, pickles, bibb lettuce and Crystal hot sauce, and is served, you guessed it, cold. No, it’s not a Philly Cheesesteak. Instead, we’re highlighting Philadelphia’s Roast Pork Sandwich from Tommy DiNic’s for Pennsylvania. Hear us out. The succulent roast pork with broccoli rabe and sharp provolone served on a seeded roll and doused in meat juice hits all the right sandwich flavor and texture notes. Trust us, you haven’t lived until you’ve tried this sandwich, which was declared the best sandwich in the country on the Travel Channel show ‘America’s Best Sandwich’. In Providence, R.I., The Godzilla from Geoff’s Superlative Sandwiches features a hefty amount of corned beef, muenster cheese, spinach, mushrooms, onions, tomatoes and Dragon’s Breath — also known as chili pepper. The blend of meaty, creamy, veggie goodness has a hint of spice. Started by two brothers in Charleston, S.C., Smoke BBQ opened in 2015 to much acclaim. The focus on locally sourced and handcrafted items translates into stellar food like the Beef & Chedda sandwich. A crunchy bun is loaded with all-natural “True Texas” brisket, house-pickled jalapeños and melted cheddar cheese. Housed in the 1915 building that once served as Rapid City’s first firehouse, Firehouse Brewing Company is South Dakota’s first brewpub. The Battalion Brisket sandwich overflows with beef brisket and barbecued onions. Add the Beer-BQ sauce, which is made with house-crafted stout brew. In Nashville, Tenn., Hattie B’s is famous for its Nashville hot chicken served with increasing levels of heat (including “hot,” “damn hot” and “shut the cluck up!!!”). Getting it on a sandwich with coleslaw, Nashville Comeback Sauce (mayonnaise, honey and a signature spice blend) and a Kosher pickle is the pro move. Barbecue is king in Texas but Noble Sandwich Co. in Austin makes a great argument for something a little different: a Duck Pastrami sandwich. “Having worked in fine dining restaurants, and really enjoying duck prosciutto, we decided to try and create a great pastrami sandwich with the wonderful flavors of duck,” says chef John Bates. He ultimately decided to smoke the whole duck, then slice it thin, pile high on toasted rye bread, smother in Russian dressing and top with house-made rye pickles. Order it “Reuben style” to add sauerkraut and Swiss. At Lola’s Street Kitchen, a roving food truck in Heber City, Utah, the menu of organic artisan sandwiches changes often. Follow along on Facebook to see the location and the menu, and look for the Salmon Ginger, featuring grilled wild sockeye salmon, cilantro cream sauce, ancho chile paste, and pickled cucumbers and ginger. Vermont favorite Noonie’s Deli is homey and comfortable, and serves some of the state’s best sandwiches in Middlebury. Go for the Vermonter, made with black forest ham, freshly sliced local apples and melted cheddar cheese on homemade honey oat bread that’s smeared with homemade Dijon honey mustard. It’s crunchy, gooey, soft and hot — a perfect mix of textures. Earl’s Sandwiches now has three locations in Northern Virginia, after opening in Arlington in 2005 with a commitment to roasting meats in house. The Pork and Fries sandwich is a work of art: roasted pork loin, chipotle mayonnaise, crispy French fries, roasted red peppers, sweet pickle chips and chopped onions are all crammed onto a grilled ciabatta for a flavorful and textural explosion. Washington is home to countless delis serving cheap banh mi, the Vietnamese sandwich made with chiles, cilantro, cucumber, pickles, mayo and some kind of protein like tofu or pork. Seattle Deli makes one of the state’s best: Barbecue Pork Banh Mi, which is served on a crunchy roll coated with mayo and filled with tender barbecue pork, loads of crunchy cukes, and pickled carrots and radish, then garnished with bright cilantro and slivers of fresh jalapeños. In West Virginia, Cam’s Ham was founded in the 1950s in Huntington, and soon became known for Cam’s Original Sugar Flaked Ham Sandwich. It’s a generous portion of sugar-flaked ham garnished with house special sweet sauce and crispy iceberg lettuce, all piled high on a toasted Grecian bun. Cheese is often synonymous with Wisconsin, so a grilled cheese sandwich seems like a must for this state. Madison's Alchemy Café makes a hearty version, called the Stuffed Grilled Cheese. Roasted broccoli, carrots, red onion and tomato are smothered in melted Wisconsin Swiss and cheddar cheeses, and a cilantro pesto sauce is spread on toasted sourdough bread for the perfect ooey-gooey concoction. What would the Cowboy State of Wyoming be without some hearty beef? In Cheyenne, the 75-year-old Albany Restaurant is home to the Prime Rib Sandwich. The bestselling menu item features slow roasted prime rib that’s served on an open-faced roll with a cup of au jus. Sandwich in some time for savings Saturday. Nov. 3 is National Sandwich Day and like other made-up food holidays, restaurants are celebrating with discounts. According to a Jersey Mike's Subs Trend Tracker report, 98 percent of the nearly 53,000 people surveyed said they eat at least one sandwich a week and 39 percent said they eat three or more per week. The survey also showed 76 percent of people crave subs for lunch and 20 percent said dinner was their preferred time. Ranker, a crowd-sourced voting platform, found the top five sandwich chains based on votes were: Jersey Mike's, Firehouse Subs, Jimmy John's, Potbelly Sandwich Shop and Which Wich. Here are the deals available Saturday at participating locations. To be on the safe side, check with your closest location before heading out. Blimpie: Get a $10 bonus eGift for every $30 in Blimpie gift cards purchased online at www.blimpie.com Saturday. Offer available online only. Capriotti’s Sandwich Shop: Get a small Bobbie, the chain’s signature Thanksgiving-leftover style sandwich for $5 Saturday with the CAPAddicts awards app. According to the company, the app needs to be downloaded before Saturday to get the special offer. 🎉 Celebrate #NationalSandwichDay with us! Get a $10 bonus eGift for every $30 in Blimpie Gift Cards purchased online! Erbert & Gerbert's: From 2 to 6 p.m. Saturday, all sandwiches are half off at participating locations. Offer valid on in-store and drive-thru orders. Limit one per customer per visit. Firehouse Subs: Get a free medium sub Saturday with purchase of a medium or large sub, chips and a drink and a coupon posted at http://bit.ly/NatSandwichDayOffer2018. 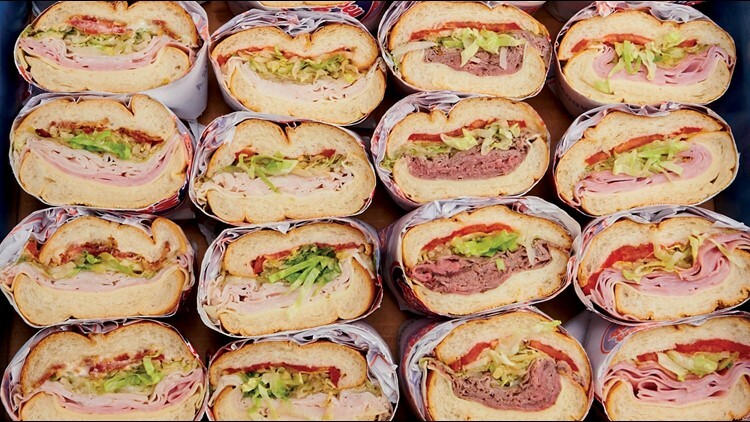 Jersey Mike's Subs: With a coupon, get $2 off any regular sub Saturday through Tuesday. The coupon will be sent to email club members and posted on the chain's Facebook page. Jersey Mike's has proclaimed November as “National Sub Month” and will run a social media contest Monday through Thursday each week and giving away prizes from gift cards to shirts. McAlister's Deli: Get a $4 McAlister’s Club sandwich Saturday at participating locations. Download the chain’s app for a free beverage at www.mcalistersdeli.com/rewards. Penn Station East Coast Subs: From 2 to 9 p.m. Saturday, six-inch subs are $3.99 for rewards members. Philly’s Best: Buy any cheesesteak or hoagie Saturday and get one free with the purchase of two medium fountain drinks and a coupon available at www.eatphillysbest.com/coupons. Potbelly Sandwich Shop: Members of the Potbelly Perks loyalty program get a free entree sandwich or salad with purchase of a kids meal Saturday and Sunday. PT’s Taverns: Buffalo chicken bacon ranch sandwiches are $5 Saturday and for $2 more get sea salt French fries with it. Quiznos: Get any 8-inch sub for $5 at participating locations with a coupon available at www.quiznos.com and in the chain’s app for Toasty Points members. For downloading the app and joining the program, get a free four-inch sub with any purchase. Sign up at www.quiznos.com/toastypoints. Schlotzsky's: The chain has a buy-one-get-one free deal on all medium sandwiches Saturday. Choose to double the meat for $2 more. Smashburger: While not a National Sandwich Day deal, the chain is selling its Smash Pass for $100 at www.smashburger.com/smashpass through Sunday. With the Smash Pass get a burger or a free entree every day from Monday through Feb. 14. Some exclusions apply. Subway: Saturday also is World Sandwich Day and Subway is offering a way to give back. With every purchase made on the Subway app and website Saturday through Nov. 9, Subway will donate a meal to Feeding America. You can earn free subs and get other offers with the Subway MyWay Rewards program. TooJay’s: Get $2 off any one of the Florida chain's sandwiches with a coupon to use when dining in or take out orders Saturday. One coupon per person. Urban Bricks: Order a half panini Saturday and the fast-casual chain will make it a whole panini. Wawa: Hoagiefest continues for a limited time only at Florida Wawa locations. Juniors are $3, Shortis are $4 and Classics are $5. Which Wich: Members of Vibe Club Rewards get a free Wich with the purchase of a Wich Saturday. Sign up for an account or re-register for the updated program at www.whichwich.com/vibe-club-rewards. More deals: Local restaurants and smaller chains may also have specials. Look on social media for promotions. McDonald’s: The fast-food chain’s app has ongoing coupons. Download the app at www.mcdonalds.com. Wendy’s: Find coupons on the smartphone app, available to download at www.wendys.com. Wienerschnitzel: Find coupons and sign up for the Wiener Lovers’ Club at www.wienerschnitzel.com/specials.